Narrow mullion mounted egress exit release. 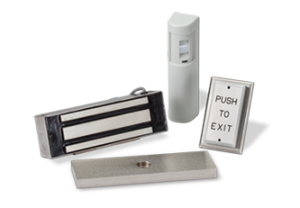 Highpower Pushplate 110 PNZ series of heavy-duty exit releases are designed for rugged applications, and are used with narrow aluminum door frames. 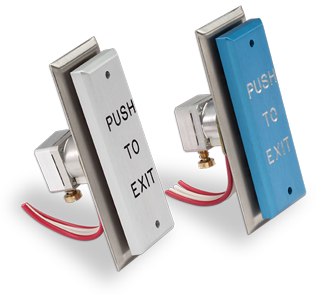 This exit release series features a stainless steel back plate and anodized aluminum front plate that actuates a time-delayed SPDT microswitch. This switch stays closed after the front plate is released for a set amount of time. Since this time-delayed action is created with a pneumatic (air driven) switch, no external power is needed for delayed action. 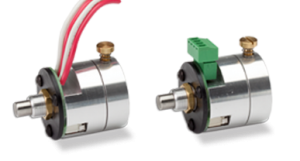 Unlike time-delayed switches from other manufacturers, durability and long life are built into this product since the travel of the front plate rather than the switch stop, limits the range of actuation. 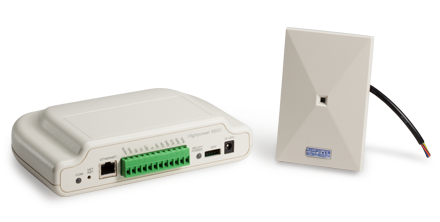 The PNZ version of the Pushplate 110 exit release provides full actuation of the time-delayed switch, providing repeatable time delay intervals. The time delay is adjusted by turning a needle valve, and can be done using a screwdriver or finger grasp. The Pushplate 110 PNZ exit release is made in U.S.A. and features a 1-year manufacturer’s warranty.